An eclectic blend of Christian techno, pop and dance music to energize your work-outs and exercise routines. I'M BRAND NEW: This particular album starts out with "Praise Tap", the perfect tempo for any warm-up routine. Then the music explodes into a faster pace with "Everything In Jesus" to get you pumped to optimize your workout. After about 40 minutes the pace is slowed as you prepare to cool down, relax, and stretch your tired muscles. This music will inspire you, energize you and lift your spirits towards heaven. The featured singer is Terry Fernandez from Vacaville, California. Terry has worked with Dr. Wiley on various projects. 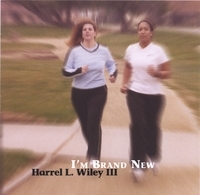 HARREL L. WILEY III (better known as Dr. Wiley or Pastor Wiley) is an accomplished musician with many years of experience. At the age of 14 he realized his passion for music. He performed in and organized several bands utilizing the musical talent he was born with. After high school, Dr. Wiley studied music at American River College and Sacramento State College. He is the well-respected and loved pastor of New Life Christian Center located in Madison, California. 1976 brought the dawning of a new life, a new beginning for Dr. Wiley - he became a Christian. His music was transformed, along with his life, and his music became inspired by heaven above. Since then Dr. Wiley has written over 300 songs that glorify Christ as they inspire and encourage others. Dr. Wiley's musical style encompasses a broad spectrum of genres, all Christian oriented. Some of these styles include funky urban gospel, silky smooth jazz, jumpin' hip hop, spicy Latin, sophisticated R&B, and good ol' country. Rev. Wiley is not only a pastor, but also the songwriter and director of his church choir. He has also written many songs for Christian artists in the Sacramento, California area. His 46+ years of experience and divine inspiration serve him well as he creates songs for his choir and local artists. He is the humble vessel that God is using to answer musical prayers. While Dr. Wiley is busy serving others, he also works on writing songs for, and producing, his own albums. Selections from Dr. Wiley's first solo gospel jazz (Smooth Jazz) album were played on "Heavenly Notes" Christian jazz radio program hosted by Don Culpepper. More recently, selections from his album, A Brighter Day, were heard on radio station KDVS in Davis, California, on the program "In Focus" hosted by Bernard Benson. Love it...very inspirational...I keep it in my computer and play it softly while I work. Sometimes I get taken away by the music and find myself meditating. Sort of like a "quiet moment" that sneaks up on you.